As long as you do a bit of research beforehand, buying wedding bands online is an okay way to go – and you can do so without worry and with the added opportunity of finding something a bit more personalized and unique. Furthermore, there’s even the possible benefit of saving money on the bottom line by doing some Internet sifting instead of hitting up the nearest jewelry store. Before you buy from an online store, make sure you have a clear idea of their reputation as a business. This comes from the BBB rating as well as taking a look at customer reviews. These nuggets of information can tell you vast arrays of information before you entrust an online space with such a purchase. Have a clear idea of what you’re looking for when it comes to your metal choice. Just because certain metals look the same doesn’t mean they are, such as the differences between platinum and white gold. Also, have some knowledge behind the different “k’s”. For example, 18k gold is much softer than 14k. Before you decide to purchase online, make sure you’ve done a bit of in-person shopping as well. It’s important for you to know the lingo and pair it with what you’ve seen in real life, tangible form. This way, you’re shopping on the Internet is a bit easier to manage and navigate. Blue Nile: There are three main pillars behind Blue Nile: the best quality, knowledge behind the purchase, and lower prices. Not only are there resources available to keep you knowledgeable of what you want, what to look for, and what you’re getting, but you can be ensured that you’re getting exactly what you’re asking for. The quality of their product is top-notch and they have one of the most expansive online selections. Shane Co.: This spot has a more traditional and familial appeal. Founded in 1971, it’s become America’s largest family-owned jeweler. Although you can do a lot of shopping online, there are various resources to utilize to get to your goal of the perfect design. There’s also a solid reputation and stream of customer reviews to set your mind at ease. James Allen: The reviews are outstanding and its founders have a combined experience of 60 years. They’ve also created a solid reputation with a decade of trust building under their belts. It’s since become one of the largest privately held online jewelry stores with a huge selection of diamonds to sift through – and that selection does include wedding bands. “When shopping with your partner for your wedding rings, it’s important to remember that this is a piece of jewelry you’ll be wearing every day, for the rest of your lives. So that means you have to choose a band that suits your everyday lifestyle. Before making the purchase, ask yourselves these questions. 1. What color metals do we like? Do you like yellow or white gold? What about rose gold? Today, the options are just about endless. You could even choose from a combination of metals, like platinum and rose gold. So think about your options and make some preliminary choices before you hit the stores. 2. How much do we want to customize it? Determine how much you will spend on your wedding bands based on what you can afford right now. If your budget is currently limited, you can always upgrade your ring or buy anniversary rings later on. This step is important to figure out first because, with so many stunning choices to choose from, you will know where to focus your search and limit any financial stresses. 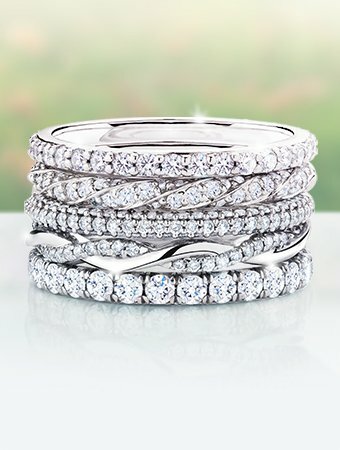 Decide if you want your wedding bands to match. Having matching wedding bands can send a powerful message of commitment to the world. Bride and groom wedding band sets come in a variety of styles, from bands which look exactly alike apart from different widths for the bride and groom TO bands which are similarly styled but come in slightly more masculine and feminine versions. Whether or not you go for matching wedding bands or individual styles to suit the bride and groom’s personal tastes, the next choice is which metal you desire: yellow gold, white gold, rose gold, two-tone, or platinum. Why You Should Pick a Platinum Wedding Ring!